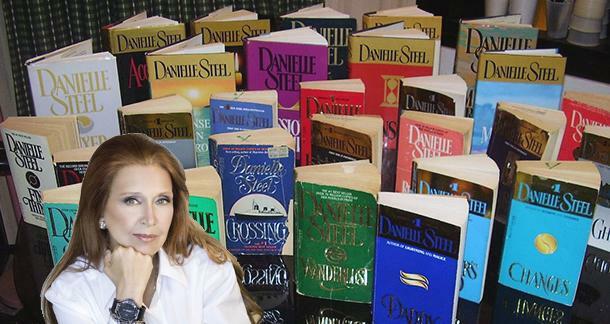 I do not call myself a great fiction writer, I am below average on that scale, but the reason I ever thought of trying a hand at fiction was this woman - Danielle Steel. I was very young when my librarian near home suggested I try reading her. Having read only mysteries and thrillers until, I asked what genre she writes. The librarian lady smiled and said that she writes life stories. Thinking of it to be a non-fiction biography kind, I politely declined. She then said that it is fiction, drama, love and everything else put together. Looking at the size of the book in her hand, I declined again. She just smiled and placed the book in my hand and said, "Keep this with you, you don't have to return it. If ever you read it, let me know how you liked it. I'm giving you this because I know you will like it". It was a book called 'The Ranch'. Not wanting to disappoint her, I began reading it as soon as I got home. After all, I could put it down if I did not like it. It was a story of three women who were college mates and inseparable. As time passes, each get busy with their own life and move on. Twenty years later, they come together one summer at The Ranch and discuss their lives. While they shared honesty earlier, now it is all about pretense. Each of the women is unhappy in their own way and is looking for ways to complete their incomplete lives. As they come together summer after summer, they begin to open up to each other and finally the honesty returns. They reach out to each other and thus begins a new discovery of their friendship and a sense of healing. I flipped page after page soaking in the words and living the life of these three women. Before I knew it, I was done with the book and I had tears in my eyes. That was when I thought that if ever I wrote a book in my life, it would be like this one. I went back to my librarian and thanked her for asking me to read it. She was thrilled that I loved the book. When I offered to return it, she declined. She wanted me to have it. I still have it and it is one of my prized possessions. Yes, the pages are now deep yellow and frayed, the cover is almost coming away from the spine, but I will hold on to this book forever. The second book of Danielle Steel that I picked up was 'Impossible'. It was about Sasha, a widow, finding love again and the ordeal she faces with her children. Next, I read 'Rogue'. It was about Max, a leading child psychologist and her ex husband, the uber dynamic Blake. They have three children together and the story is about their life. Do you notice something common here? Yes, the protagonist in all her books is always a woman. The story is about her life and the people in it. This exactly is the reason why Danielle Steel will always be one of my favorite authors. You cannot put a finger on the genre she writes about. You can call it fiction, drama or anything else you want. I would echo my librarian and call it 'Life Stories'. I have read so many books of hers that I have lost count. There is not a single book of hers that I have not liked. Every woman is a heroine in her book and you want to know more and more about her. It is not easy to write an entire book about a single character and her life. Especially when there is no mystery or thrill involved. But Danielle Steel excels at it. She doesn't make a woman look like a super woman and the epitome of grace. She talks about woman like they actually are. Negatives, imperfection, flaws and everything. Not all of them make the right decision, but no matter what choice they make they stick by it and make it work. They deal with life in their own way, right or wrong is up to the reader to decide. You get so engrossed in their life that you want them to be happy, no matter what. I see myself in so many of her protagonists, most of them actually. Especially because most of her women are strong, independent and have a life of their own. I also love the titles of her book. They are short mostly, but do complete justice to the story. 'Wings', 'Full Circle', 'Lightning', 'Remembrance', 'Sisters', 'Country', 'Accident', 'Star' etc etc etc. No other writer can portray a woman as well as Danielle Steel does it. She has written more than a hundred books till date and most of them are about women and their lives and yet none of it is repetitive. Some of her stories do have some flaws and in some books the editing could have been better, but every book does justice to the woman in it. Full points to her for that. She is traditional and old fashioned at times but soon enough she surprises you with her broad mindedness. She celebrates women in every book and this is exactly why all her stories are worth reading. Her stories have romance, drama, betrayal, loss, agony and every emotion that you can possibly think of. It is all about life and human relationships. Like I said, she writes life stories. Currently, she also happens to be the best selling author who is alive. Have you read her before? Which of her books is your favorite? I don't enjoy reading Danielle Steel, however I really liked her 'Legacy'. Recently, I was discussing DS with my aunt who is a big fan and she said 'The Ring' and 'Zoya' are her favourites. Have you read them? Nope, not these two. But I will now. I've never read her cos I had assumed she writes chick-lit. And this assumption was reinforced by my guru Sri Sri Stephen King who dislikes her works for some reason. But this post has me reassessing all that I had thought about her. It actually sounds quite feminist and positive to me, at least the story of Ranch that you've summarized. There are many of her books in Blossoms (and literally everywhere else). Let me see if I can grab a copy of something. No, no, no - read her. I'm sure you will love it. Especially the strong female characters! Ha Ha :D I had the exact same perception Sreesha. This is such a wonderful post, Soumya! You know I'm not a bibliophile and I started reading pretty late in life! But don't raise your eyebrows or roll your eyes after learning that I haven't read a single book of Danielle Steel!! But after reading your post, I will! I sure will! I think my first book by Danielle Steele was The Ring. It is also a movie. I loved her books for the way she wove her story and of course the size of the book was super-gratifying. And yes, women-focused books are always my favorite. I have fond memories of my Mom and I fighting over who'd read the book first and bribing each other with all sorts of things. Lovely choice for D, Soumya! The fact that Danielle Steel says things like they are, has female protagonists, and speaks about life stories is interesting. I wonder why I never picked up her books earlier! Yes, yes, yes! Start with The Ranch. Totally agree. The first two you've mentioned are my favorites as well. I like reading her books. I was awed by Zoya. The book that I'm currently reading is by Danielle Steel. It called Prodigal Son. Though the protagonist is a male, I'm enjoying reading it. Zoya is something a lot of people have recommended. I'll look for it now. I like all her characters though. Both male and female. So sweet of that librarian to introduce you to the Danielle Steel. I started reading her in 11-12th class and read almost all her books back then. I dont think, I have read her after college. Your post has rekindled my love for her stories and I am going to pick her books again. I tried to read her years ago...I think I was 17 or 18 ...but never really got into her and then never went back. Maybe I should give her a second chance. Many people have told me this, but then again it is not everyone's cup of tea. Give her another chance, if it works it works. Today on my Journey To Courageous Living E is for Exhorted to the limelight by a hat. Come, check it out. Do give it another shot. Please. Do try sometime. Thank you. I haven't read Danielle Steel yet... will grab one soon.. Such a wonderful librarian :D I have read only one of Steel's book and I remember liking it. Probably I should check out more of her books.